Udemy is an online course marketplace who’s mission is to “help anyone learn anything” according to their website which also states that every course is “available on-demand, so students can learn at their own pace, on their own time, and on any device.” The platform caters to learners and businesses offering over 35,000 courses ranging from photography to mobile development. At it’s core, Udemy offers an online course publication tool that allows instructors to create their courses and put them up for sale both on Udemy’s marketplace and the instructor’s own website. The instructor sets the selling price and shares the revenues with Udemy at varying rates, depending on who initiated the sale. The instructor keeps 97% of the revenue if the sale originated from their own website and 50% if the sale originated from Udemy’s website. Besides the obvious focus on the students, Udemy has a significant focus on the instructor, offering several resources to aid instructors in creating courses. To start with, Udemy offers a free “How to Create Your Udemy Course” which utilizes the platform itself to deliver it. A support website is also available offering several articles such as “Getting Started: How do I create my Udemy Course?”. There is also a closed Facebook group is available for instructors to share experiences, get help and learn from each other. These resources focus on planning, producing, publishing, and promoting the instructor’s courses. The designers seem to believe that instructors, as learners of the tool, need to understand how teaching online is different from teaching in a classroom. The support material focuses on guiding the instructors on best practices, media quality, and pedagogical styles that best work in this environment. On top of these resources prior to creating a course, Udemy enforces a course review process once the course is ready. This process entails a detailed inspection of the quality of the media, the course content organization, as well as the frequency of different media utilized. For example, a course with only text, only slides, or only videos – will be rejected. A mix of media, quizzes, and presentation styles is therefore valued by Udemy as essential for the learners (students) to succeed. Judging by the content presented, designers see as barriers to developing an understanding of the subject matter is course planning and digital literacy. Starting with guiding the instructors on learning objectives and general planning of the course, the designers offer basic pedagogical knowledge. Moving on to the production of the course, the designers offer detailed instructions and specifications on audio and video size and quality as well as filming and editing tips, for example. Publishing instructions are also offered guiding instructors on pricing strategies, free course previews and other information about how to make the course more attractive to students. Finally, Udemy provides suggestions on how to drive sales of the course. The features the designers are leveraging in this implementation revolve around cloud storage and Ajax. Cloud storage means that all the content is uploaded to Udemy’s platform and stored in their environment – including videos – for no extra charge to the instructor. This allows complete control of the content and delivery quality of the courses. Ajax is a ‘modern’ technique of creating web pages that allow dynamic loading of content, draggable elements, and addition of new sections without the necessity of reloading the page. This provides a fluid and intuitive interface that makes the job of creating the course content actually pleasurable. On the student’s end, the interface is also intuitive, clean, and easy to use. Each section of the course is presented without distractions and provides clear actionable items to control the playback. I would also be very interested in interviewing instructors who have published courses on other platforms to understand what Udemy’s course publication tool is doing right or wrong. From personal trial and error, I’ve found Udemy’s interface the easiest to use and the one that provides the most scaffolds for the instructor. Their review process is also extremely helpful with attention to minimal details showing that there are actual humans reviewing the course content. This ensures course quality for the students and gives the company a high level of credibility as well as showing their care towards the learner. The tool is making effective use of unique features of this technology. 2 – Strong: Udemy’s uses the latest Html techniques to provide a good user experience. I would have judged it exemplary if there were a drawing tool embedded in the platform – something like a white board that would record my strokes and voice over from within the tool. The features of the tool demonstrate an understanding of the target learner. 3 – Exemplary: Udemy course publication tool is setup in a way that it asks for information from the instructor in a structured and familiar manner using terminology commonly used by teachers such as course goals, course summary and other features one would expect in a pedagogical tool. The design of the tool suggests an understanding of the challenges unique to learning the target content. 3 – Exemplary: Udemy’s wide variety of content, tools and possible interactions amongst instructors show a great care towards the main driver in education – the instructor. They understand that teachers, educators, and subject matter experts may not have all the TPACK necessary to become an online instructor. To supplement this, they try to provide content in various formats with several examples and support for them. A compass is a tool that allows us to orient to different directions, charting a course toward whatever destination we have chosen. For this section of the final, you will create a tool to organize the different concepts covered in this class. In addition, it should allow us to “map” different EdTech products in some way as well as to guide those who use it toward effective learning experiences. This is a very open-ended assignment, which can be creatively interpreted. Use it to push your thinking about how these concepts fit together! It can be visual, or even physical, if you so choose. It can take the form a concept map or a chart or a poem, or any number of other forms. We expect it to fit into 1-2 pages. However you choose to present your thinking, it is important to clearly convey what is particularly important to you. In this assignment you are articulating your position on the pedagogies conveyed by the readings and the course concepts. articulate which way is “North” to you, and why? Regardless of your current profession and experience, you have been impacted by education and technology. As we progress in our society, we must think how might we deliver the best educational content, implement the most effective teaching methodologies (pedagogy), and the utilize tools that engage both learners and educators in meaningful learning experiences. Education is one of the most complex issues in our society and has been since the beginning of civilization. Without education, how does a community, a company, a country, and the human race progress? This paper, along with the Pedagogical Compass (https://prezi.com/zgdhgwrlealw/) will present an overall view of who are the stakeholders, how education happens for educators, how learning happens, and what might we select as relevant content for the future. Even if you are not directly involved in education, you certainly have faced the need to teach someone, explain how something works, train a new employee, present your research, your work, or your thoughts. With this in mind, we propose to look at educational tools with a set of lenses that might provide an encompassing view when designing effective learning tools. 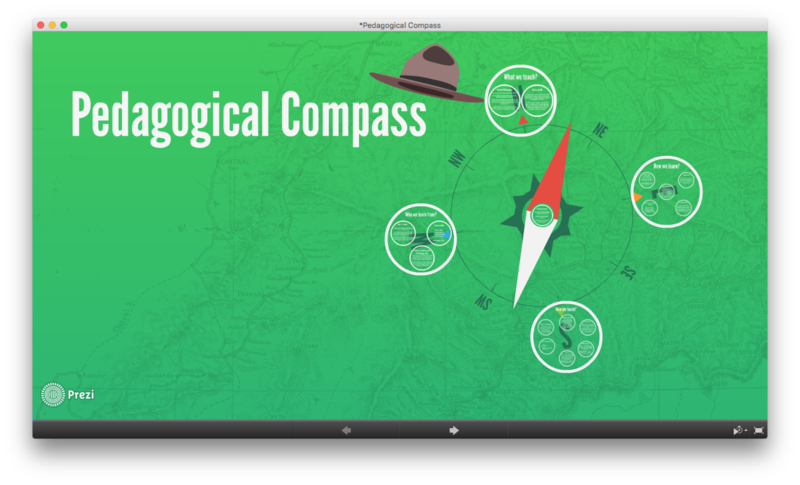 The Pedagogical Compass looks at what we teach (North), how we teach (South), how we learn (East), and who we learn from (West). Through these four cardinal positions we might facilitate and hopefully stir your thought processes based on current research, learning theories, and experiments done in the field. If we look at user experience designers, we generally consider a tool’s graphical layout, the affordances provided by the tool, it’s usability or ease of use, and finally the service and/or outcome the tool offers. Game designers go a step further in looking at how the user repetitively engage with the tool, reward systems, and how the gamer learns and progresses in the gameplay. One effective framework to use is the “Core Loop” which looks at every step of engagement one has within a game. It involves a cycle which starts with 1) assessment of the current scenario, 2) choosing the correct action, 3) aiming your action appropriately, 4) launching your action, 5) being rewarded (or not) by the consequences of your action. Once rewarded, you go back to step 1 where you assess your next move. By identifying the elements in each of the loop’s nodes we are able to better visualize the process and hopefully improve it. What happens between these nodes should also be considered in order to change the speed of the loop’s cycle. This approach can be particularly useful in designing a learning tool. The learner, when engaging with new content or knowledge that must be acquired, will first assess what is known, what resources are available and what needs to be achieved. Second step is to choose a potential approach to absorbing the content such as reading, taking notes, and discussing the subject matter with colleagues. Once the action is chosen, one must aim at the appropriate content to engage with, launch your action and finally be rewarded by learning, understanding, and/or comprehending the content. We then continue back to the first step where we assess once again what we know, what we should do, how to apply it, take action, and be rewarded by the results. Yet designing a learning tool is not limited to the learner’s core loop. Learning happens to someone, within a social and cultural context, setup by a teacher, guide, or environment, and the interactions of these elements. By preemptively defining how we will evidence the intended learning, we might do a better job when designing and refining each step and activity along the learning/teaching experience. Another powerful concept is that we learn by teaching. What better way to understand a concept but to explain it to someone else? Not only must we utilize our metacognition to access the key elements, but we must articulate in a clear manner so that others can grasp the knowledge at hand. On top of that, humans naturally seem to care more about helping others than helping themselves. An increased level of responsibility and engagement with the content when teaching others is tapped into – it’s called the Protégé Effect. The research looked at how children taught a Teachable Agent (TA) and how this affected their own content acquisition. With this is mind, the role and actions of the teacher is greatly expanded and complicated since it must consider not only what is happening inside the classroom but also outside the classroom. Engaging students, triggering and maintaining their interest in the content is a great challenge that can be modeled by the Four-Phase Model of Interest Development developed by Hidi & Renninger, 2006, which looks deeply into how interest progresses from an initial casual level of engagement to a more deeply involvement with the subject matter, where the teacher’s role is to provide positive feelings towards the content, generate curiosity to encourage further research, provide opportunities for learning by offering content and pointers towards meaningful resources, and a guide on research to enable learning progression. By providing this, the interest level of a learner will move from Triggered Situational Interest to Maintained Situational Interest to Emerging Individual Interest and finally to a Well Developed Individual Interest. Designing learning tools might be the most complex challenge we face in our society, not only from a pedagogical standpoint. We must look at the scalability of teaching, content relevance, socio-cultural implications, cognitive developmental stages, interaction with peers, policy, assessments, teacher professional development, costs, and implementation – to list a few. We invite you to become part of this ever evolving field, take on the challenge of creating a better future for humanity, develop, implement and research how might we help spreading knowledge across the world in an effective, considerate and meaningful way. We need designers, teachers, engineers, developers, psychologist, philosophers, doctors, lawyers, leaders, and anyone with a desire and drive to share knowledge and improve the tools we have to do so. How could we incorporate game design practices into education? Act 1 – Why should you read this paper? Want to become a learning tool designer? Care about learner? Care about teachers? Care about reducing the digital literacy gap? Who are you? Teacher? Policy maker? School leader? Designer? Engineer? Developer? Our target learner was Achu, a calm and smiley 12 year old boy who is fond of playing basketball, watching HotWheels videos on YouTube and painting. He follows instructions well yet rarely initiates activities on his own. That is also the case with communicating with others, unless he needs to go to the bathroom or needs more paint for example. He responds to questions but is not always sure about his answer. He often repeats the last words heard when answering. Our impression was that he knows the answer yet has trouble externalizing it appropriately. HMW help him say more words? HMW motivate him to want to communicate? HMW stimulate him to produce original words? HMW make him comfortable sharing words with others? HMW make him feel like his words have value? To achieve that, we created a low-resolution prototype which consisted of playing a video with no sound on the laptop and prompting him to narrate what was going on. The final goal was to have a video with his voice narrating the events. We were able to engage him in the activity and on a few occasions, he actually generated new words, when prompted. We felt that the prototyped achieved some of the initial goals but there was still something missing to be considered truly effective. After presenting our finding from our initial prototype, we dug deeper into what was missing and discussed some more potential solutions. We finally connected the idea that the value of communication is shown more evidently when helping others. We could use a teachable agent in the product and elicit the Protégé Effect (Chase, Chin, Oppezzo, & Schwartz, 2009). We built on the idea that while Achu might not find it always natural to speak for himself, he might find it compelling to speak to someone to help them. We introduced Tom in our prototype. A blind cat who asked Achu for help figuring out what was on the screen. We scaffolded the experience by creating a simple learning progression. We start with a single word on the screen. Tom asks Achu what is the word. Once Achu says the word, Tom thanks for Achu’s help. We wanted to ensure that we were ‘valuing the process and not only the final result’ (Dweck, 2007). After 3 words, we moved on to 3 short sentences, 3 pictures, and finally 3 videos. On the day of the test we were unsure about the results and therefore also took a few other activities to gauge Achu’s engagement and levels of communication we could elicit from him. We had him play with an App that records what you say and plays it back with a funny voice through a character. He was soon bored with the activity. We moved on to observing him assembling a jigsaw puzzle with a phrase instead of a picture as the complete set. He was very fast at combining the scattered words into a perfect sentence. He was also prompted to read it out loud, which he did with ease with the exception for one word he did know how it sounded. He seemed embarrassed but was reassured by the teacher that it was ok to say that he did not know – which he finally did. This episode showed us that the Protege Effect might actually work on him since he would not want his ‘friend’ to not know something. Our final activity prior to testing our prototype was to engage him with text messaging. He clearly understood what was going on and responded by typing onto Alex’s phone while I was in another room with the other phone. His trouble was dealing with the small keyboard on the phone but it showed promise in that he might engage well with this form of communication with a larger keyboard. Finally we tested our prototype. Achu was immediately fond of Tom, the cat and rapidly replied to his prompts. The words, sentences, and pictures we verbalized promptly. The video also succeeded in promoting verbalization yet it took some more time for him to think about what to say. Once he did it and Tom thanked him, his energetically and positive reaction was priceless and strong evidence that the Protege Effect worked. He even clapped his hands and said “Achu is helping the cat!”. What surprised me the most during the process was how a small adjustment in the product resulted in such a big change in the levels of engagement. The process of narration was still the same, yet the purpose and motivation it was made clear to him. Narration for narrations sake did not have value for him. Helping Tom did. It also reminded me that we were eliciting in a small way Joint Media Engagement (Takeuchi & Stevens 2011) between Achu and Tom the cat. They were both consuming media and helping each other out – feeding off of each other – learning from each other. A lesson learned that I will carry onto all my future design processes. One thing I felt was missing in the process was a greater level of engagement with Achu’s teachers, Marina, and eventually his parents. To fault was lack of time, schedule conflicts and few attempts on our part to communicate more frequently with the stakeholders. Yet for the purposes of the course and the learning process, the interactions were fruitful and thought provoking leading always to new iterations and fine tuning of the product. The collaboration within our team was effective. I assumed the creative and technical role while Soren looked at our product through a more pedagogical lens and Alex with the documentation and write ups. It was a fruitful process where I felt each one in the group contributed effectively and pulled their own weight throughout. My multimedia skills helped us to rapidly create the prototypes, presentations and video. Soren’s teaching background helped us selecting the appropriate language, level of complexity, and scaffolds towards learning. Alex helped us with summarizing and documenting our meetings, tests, and findings. Our process was very much guided by our class activities. We met only twice outside of class, not counting our three visits at OMS. This does not mean that we did not communicate outside of class. Through Google Docs we constantly collaborated with the elaboration of the presentations, texts and ideas. This demonstrated the effectiveness of the scaffolds we received as designers from our professor as well as our groups efficiency to generate ideas and agree with the path to take. Next time around I will certainly work again with all the collaborative digital tools we used to document and brainstorm our ideas. I will also take the lead in creating the multimedia content since it is something I enjoy doing and see how valuable it is. As far as doing things differently, I would only wish to have more time to interact with the stakeholders and the learner. I will push harder to communicate more effectively with the intended audience and try to get more insights as to what the learner’s needs are. My learning experience during the project was more one of trying to apply learning theories to the project than trying to be overly creative, as was the case in some previous projects I’ve worked on. The challenge was to design for a learner which we knew very little about, but using the educational lens we were able to apply and test learning theories with a certain success. A core motivator for me was actually a little bit of the Protege Effect mixed with the Four-Phase Model of Interest Development. Looking back at the quarter, I noticed that much of my effort towards creating a better product was drawn from wanting to please the other, to teach, and to provide a benefit to his life. Not to mention the desire to please the teacher as well in the process. As for the interest development aspect of learning, I feel I reached Emerging Individual Interest, close to Well Developed Individual Interest – depending on if I am able to evolve the product in the future. More importantly I believe I improved my skills and techniques of rapid prototyping. The pressures of creating a functional prototype to be placed in the unguided hands of a user were removed by the “Wizard of Oz” technique. It allowed me to create more freely and rapidly. It allowed me to continue thinking freely about potential solutions instead of being vested on a product because of all the time I spent in detailing a quasi-product. Yet I also learned that being able to design this way also requires some previous experience with prototyping. You must be able to predict user’s interactions that might completely break the desired effect. Therefore, even in a free-formed rapid prototype has a Minimal Viable Product. Chase, C. C., Chin, D. B., Oppezzo, M. A., & Schwartz, D. L. (2009). Teachable agents and the protégé effect: Increasing the effort towards learning. Journal of Science Education and Technology, 18(4), 334-352. Dweck, C. S. (2007). The perils and promises of praise. Kaleidoscope, Contemporary and Classic Readings in Education, 12. Takeuchi, L., & Stevens, R. (2011). The new coviewing: Designing for learning through joint media engagement. In New York, NY: The Joan Ganz Cooney Center at Sesame Workshop. Everyone wears the same hat at the same time, but could be assigned to a team member in a more permanent role. Managing – Blue – what is the subject? what are we thinking about? what is the goal? Information – White – considering purely what information is available, what are the facts? Chatted with Omair about my learning problem while walking to Vaden Medical Center… got there late so had to reschedule the TB shot for next monday. Omair’s desire was to have a tool that would help him remember all the topics he must cover. Using keywords and a mind map for each piece of content, the system would alert him if any node was not covered yet. His main concern is covering the entirety of the content. The more I look at the problem, the more I see that I would need to focus on a subject matter due to the particularities of each, pedagogically speaking. To try to create an overarching generalized system that helps you create ‘better’ courses seems like an outreach and a technocentric view of a solution. My initially narrow view of wishing to create a magical tool that would help me create a course by giving me tips and suggestions along the way might have the be reconsidered. I am starting to see that a larger challenge that has to be addressed is teacher professional development. How do we scale it? How do we integrate it into their daily routines? Today was presentation day – OMS parents came in to see all the group’s videos – interesting ideas – but reflecting back on the class, I felt a slight disconnect between the project and the course content. I feel the prototyping assignment could be a course on its own. In any case – the reception of all the ideas by the parents and panel of experts was fantastic. Still waiting for permission to publish the video publicly. Working on a 2 minute video presentation of our prototype for ‘A’ at OMS. Achu is twelve years old, full of smiles, and loves art, basketball and HotWheels videos. Achu’s vocabulary is plenty big, but he doesn’t always use it, instead choosing to repeat the words of others instead of what he really thinks. We believe that if we can help Achu to generate more spontaneous language, over time, he might find it easier to express himself and share his perspectives with the people around him. So we set out to design a tool that would allow him to do that. For the first prototype we decided to draw on Achu’s interests and build a system where he could watch and engage in basketball or HotWheels video. Narrate it when thoughts came to mind or when he was prompted. Then replayed the video with his recorded narration to show him the value of his words. He started using more new words! And he enjoyed hearing his voice in the replay of the video. But we still thought we could do better. We wanted to see if we could increase his level of engagement and the complexity of his spoken ideas by drawing more on his strengths and core motivations. Knowing that Achu is kind and caring, our new hypothesis was that he would be more engaged and motivated, if he had to help someone else. Playing off the idea that people are more motivated to work hard when someone else depends on their teaching. It’s called the protege effect. Meet Tom, the blind, talking cat. All of a sudden, there was something at stake, a character that needed help. By chunking the video and having Achu explain what happens in each video chunk to Tom the Cat, we tapped into Achu’s strength of empathy and he was motivated to take on the challenge of spontaneous language creation. We saw engagement, positive affect, and complex explanations. Time with the intended user and rigorous user testing are critical to success. Every interaction our team had with our OMS student yielded more ideas and insights. It can be challenging to figure out whether an idea is not good or whether its implementation was the issue. It’s quite possible that a user will not engage well with a prototype even though the basis of the prototype is a worthwhile idea. Consequently, it is important to identify the critical learning mechanism to be tested and give the learner different ways to engage with it. What would be motivating to us is not necessarily as motivating to other learners. For example, while our team might be excited to narrate videos, our OMS learner was much more motivated to help a blind cat understand the video. It is important to use a learner’s strength to help him improve upon his weakness. With our OMS learner, we found greater success when we played off of his strength (caring for others) to motivate him to talk. The Wizard of Oz technique enabled our team to rapidly test, change, and evolve our prototype. The freedom to build just part of our prototype and simulate the rest of the prototype experience also allowed us to test several backup ideas, which helped us gather additional insight on our learner’s motivations and interests. We realized how important it is to record and review testing sessions. By closely analyzing when our learner showed engagement, we were able to pinpoint the specific mechanisms through which our prototype encourages participation and positive affect. The “protege effect” – or more broadly the task of teaching someone else – is a powerful motivator. Our strongest prototype turned our learner into a teacher that would explain videos to a blind cat who couldn’t see them. Our learner was quite responsive as he saw real purpose in generating words to help the needy creature.